We’re not here to dash your dreams, but the growing custom shipping container trend has definitely inspired a lot of unique ideas in shipping container homes. And while shipping containers themselves are pretty simple, all those industrial chic additions (retractable walls, floating staircases) can make building with boxes a bit more complicated. Here are three top considerations we recommend you think through, before deciding if container living is really for you. At Falcon, we are big fans of upcycling—i.e. repurposing the global surplus of steel shipping containers for broader, long-term purposes. But we’re not setting out to build the world’s most luxurious treehouse (no offense, Pete Nelson), or try to make a Conex box look like the Sydney Opera House. Instead, we create safe and efficient living spaces can be customized to an extent—in terms of stacking and joining multiple containers. But they can’t be made to replicate the Guggenheim. That’s just not what we do. Contrary to popular belief, shipping containers aren’t dirt cheap. A quality, used, 40-foot container can cost around $4,000. (There are cheaper units out there, but we wouldn’t recommend living in them.) Four thousand is certainly less than framing and foundation materials for a traditional home, but it doesn’t represent the entirety of a shipping container home’s price tag. 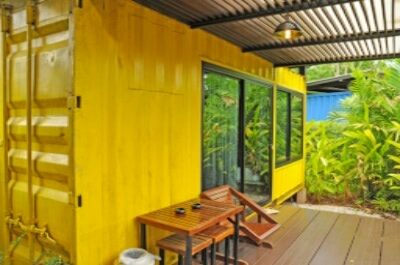 Don’t assume that a shipping container frame will allow you to outfit your pad with Brazilian hardwood and gold leaf ceilings. If you're going to incorporate nice materials, be aware that it may have to be done onsite. Those beautiful counter tops sometimes crack on the road. For a lot of container enthusiasts, our living space containers are a starting point, but they are oriented towards workforce housing. They emphasize functionality in challenging jobsites. Buyers seeking something more chic should work with an architect or interior designer to personalize their containers (having fun with exterior paint, patios, window boxes and living roofs are just a few examples). If you're seeking a custom container building, come talk to us about modifying the modules. We'll collaborate with you and your architect to determine the what will work for you. Still think you’re in the market for a shipping container? Already know what you're looking for? Give us a call at 877-704-0177 or Get a quote today.